Like I mentioned, the girls and I are in Georgia. 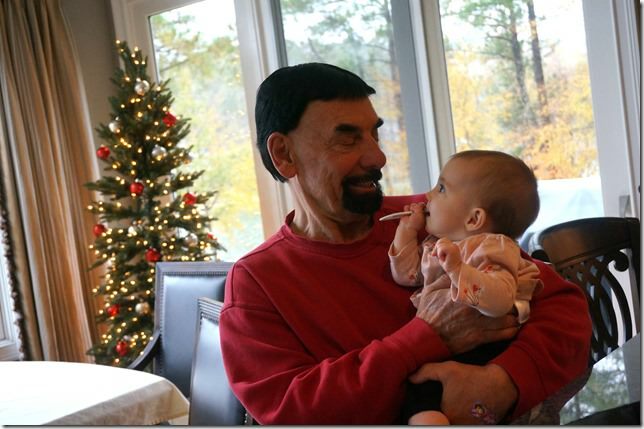 My parents live just outside of Atlanta, so we’ve been bouncing around the state a bit while soaking up family time. This post should most likely be titled ‘my family scrapbook’ so there’s a little heads up before we dive in. We spent Saturday in the classic city. For those unfamiliar, that means in Athens, GA, also known as the most magical place on earth (you thought that was Disney?!) and home to the Georgia Bulldogs. 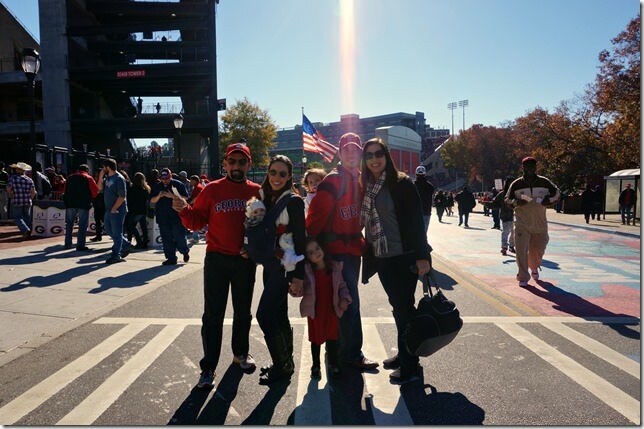 It had been years since I had been there and I loved getting to walk the streets of downtown and watch an easy-win game with my family. 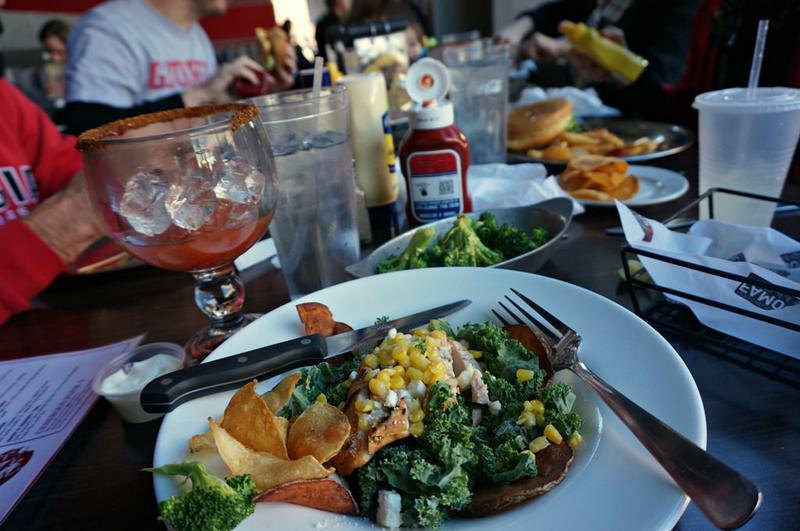 We grabbed lunch before the game at Herschel’s (high fives to anyone who knows the restaurant’s namesake). The bloody Marys were on point! I loved letting the memories of college flood back over me. 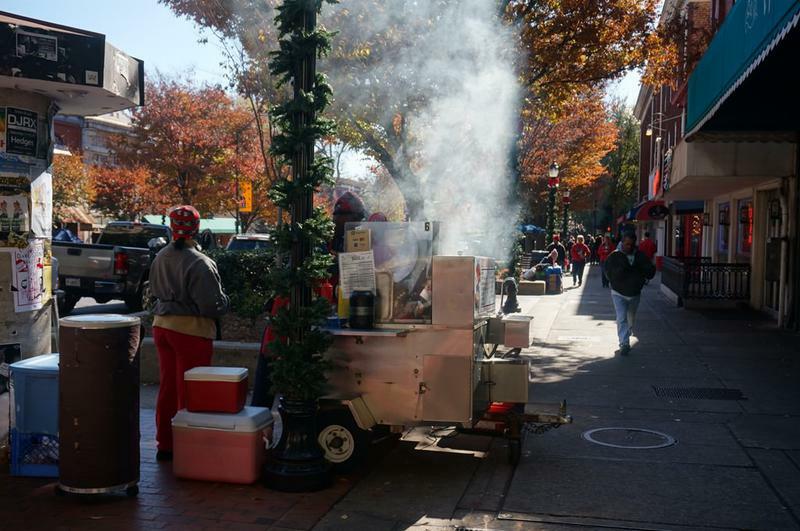 I was particularly nostalgic inhaling the sweet aromas surrounding the hot dog cart, where I ended up several times at 2am. Oh, college. It was a gorgeous day for football and we grabbed seats in the nosebleeds so all three baby girls (my sweet niece, Kyla, too!) would have adequate room to wiggle. I always knew he was a Georgia fan. Sunday was rainy, so we enjoyed some downtime around the house. Grandma Betty showed Hailey how to unwrap peppermints for a fun and easy little craft. 2. 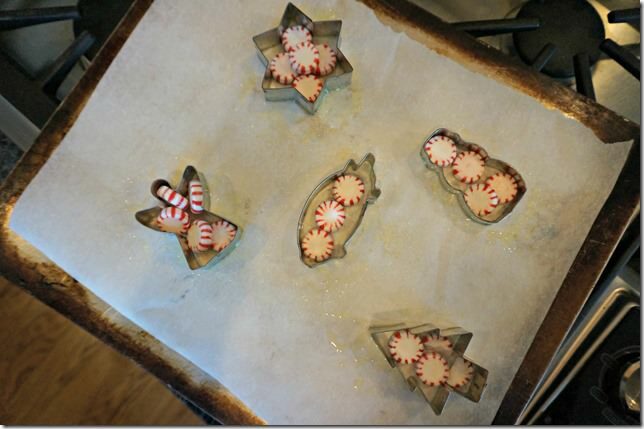 Spray metal cookie cutters with cooking spray and place on parchment paper. 3. Add mints and bake for 5-7 minutes until melted. 4. Remove from oven, use a toothpick to poke a hole through the top and allow to cool before removing the cookie cutter. So cute to hang on the trees! 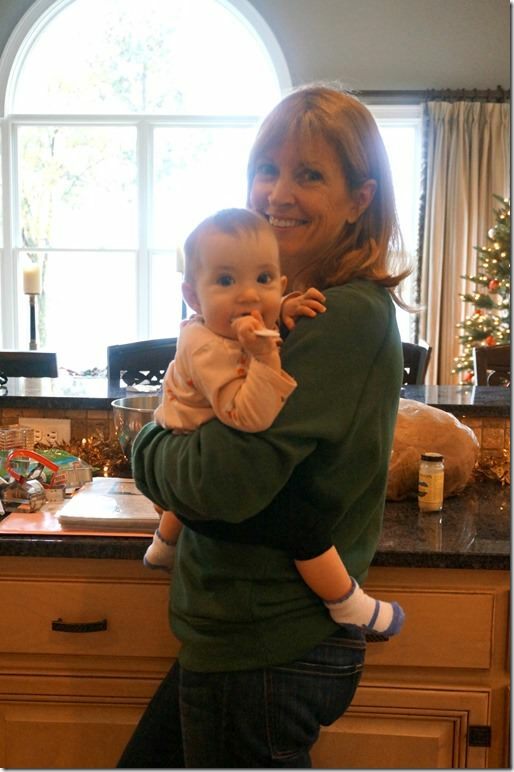 While Hailey worked on that, Kaitlyn enjoyed snuggles from everyone. Yesterday mom and I decided to head into Atlanta to check out the aquarium, something I’ve been itching to do for a long time now! We figured it would be a slow Monday, but we forgot that the kids were out of school. It was slammed! But it did not hinder our enjoyment. How could it with scenes like this? The tunnel was absolutely incredible. But the Dolphin Tales show really took the cake. 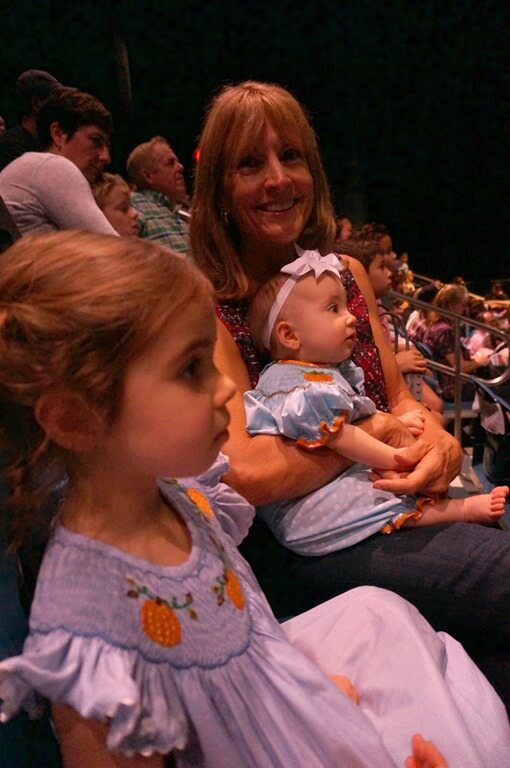 It was an exciting production, a play/dolphin show hybrid, that kept all of us enthralled from start to finish. I feel out of sorts being away from home and routine for a longer stretch of time, but I’m really loving the family time and looking forward to even more to come. I’m trying to enjoy every moment of Thanksgiving before giving into my desire to blast Christmas music. When do you start decorating or listening to Christmas music? I always try to wait until after Thanksgiving, but I’ve got an itch to bust out some Jingle Bells! 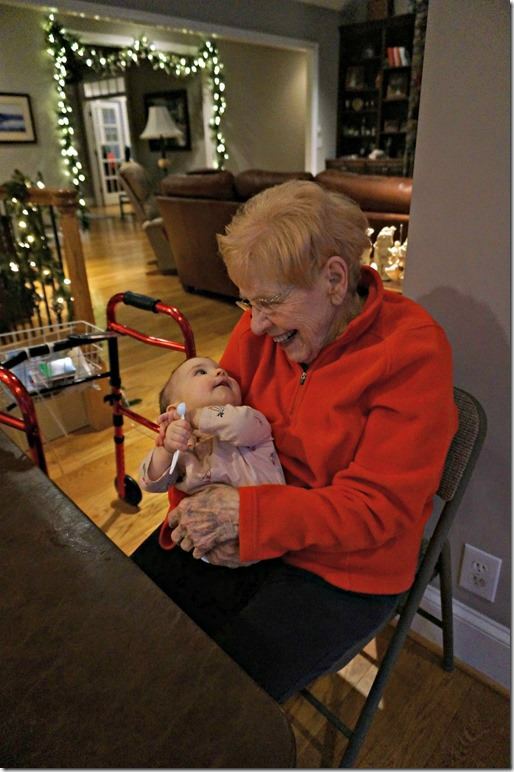 US peeps- are you going to get to spend time with family this week? I try to wait until after thanksgiving to start Christmas decorating and music but it is so hard when it is all around you. We start the day after thanksgiving full force!! I LOVE that ornament idea! I’d totally eat mine. Have fun in Georgia! We’re heading home to celebrate Thanksgiving with my family in VA Beach. I feel like this week is fair game for Christmas tunes too! I now give myself permission 🙂 Safe travels!! I’ve been reading your blog for years, but don’t comment often. 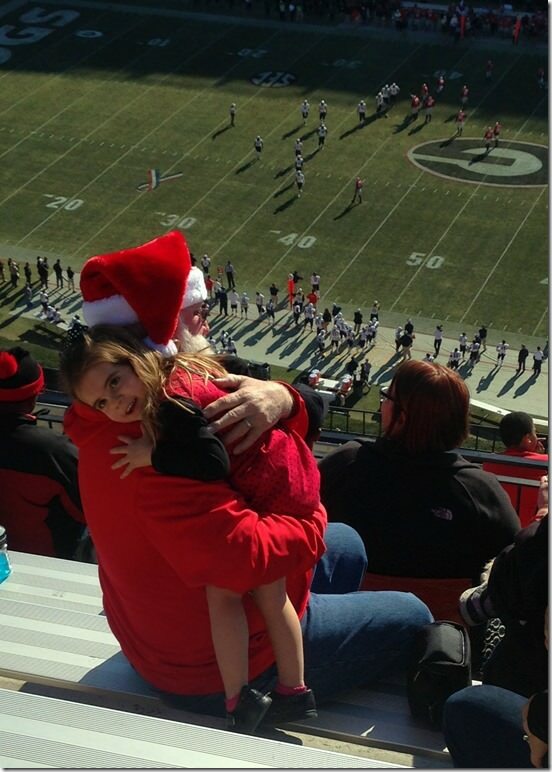 As a UGA alum with a 5 month old girl, I’m so excited to see that you took Kaitlyn to a game! We have been dying to go, but have been unsure if it would be to loud/crazy. 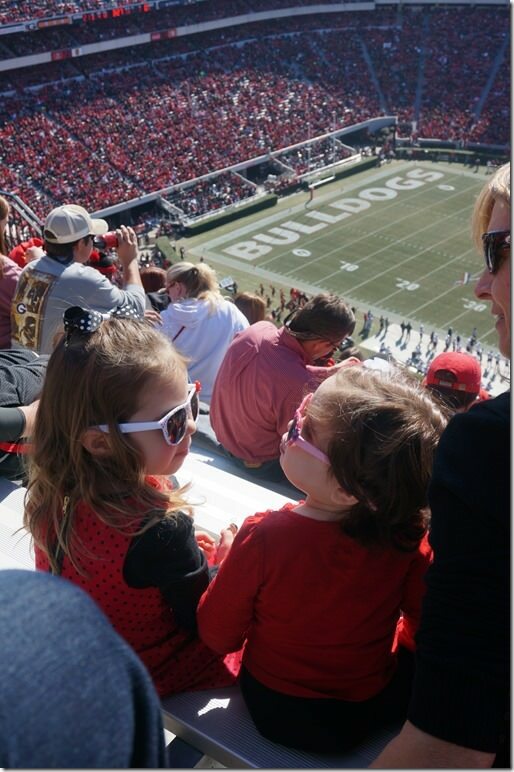 Any tips or advice on gameday in Athens with little ones would be greatly appreciated! 🙂 Go Dawgs! Another dawg fan- wahoo! It was (obviously ) Kaitlyn’s first game and it went really well! She napped on the way there, then I fed her in the car before we went to lunch. I carried her in the ergo and though I had to walk stairs at the game (great exercise ;)) to get her to sleep, she did nap in the ergo during the game. I think all the crowds acted as white noise. I nursed her in a corner of the stands too, and that worked fine. I would recommend a less-popular game (Charleston Southern instead of, say, Auburn). And I actually think the crowds and craziness entertained her! As one dawg mom to another, I say DO IT. It’s surreal to be back there with your baby in tow. I am so glad you finally got to get back to Athens for a football game! There is just something so nostalgic about spending time on your old college campus. 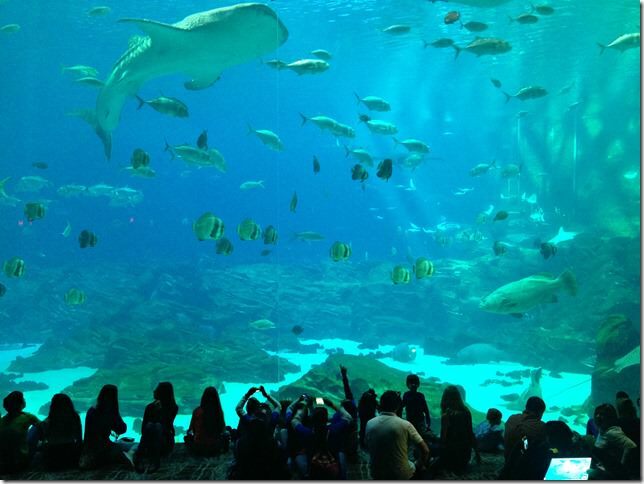 I have been wanting to go to the GA aquarium! It is only a couple hours drive away from us, and I think my son would LOVE it. Yes! My inlaws do live there! Well, did. They are in the process of building a house in SC and are splitting their time currently. You should definitely check out the aquarium- it’s incredibly well done and right across the street from centennial park which made for a great stop once we left. Hailey got to get her energy out running around the playgrounds. I love the ornament idea & love that your grandma showed you how to do it! I grew up in Atlanta, so just about every school field trip was a visit to the aquarium, the Coca-Cola headquarters, or the Varsity. We put up a tree after Thanksgiving, but that’s the extent of our decorating. Spending Thanksgiving day with both family’s and the remainder of the weekend working. I always wait until the day after Thanksgiving to begin my Christmas decorating, but I will listen to Christmas music before turkey day if the radio stations start playing it (apparently they do here in Colorado). No family coming into town this Thanksgiving because they all have tickets booked to see us and our new baby when she arrives just before Christmas! We will be splitting our time between Richmond and Pittsburgh! 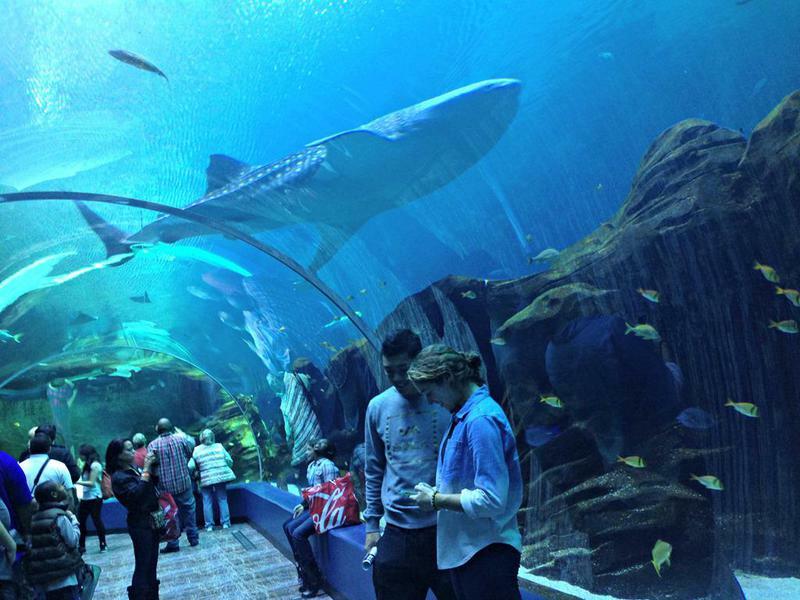 That Atlanta aquarium looks awesome. That tunnel is too neat. Are your girls wearing matching blue dresses in one of the pics? Total nostalgia! I remember when my mom dressed my sister and I like that. I always look back at those pictures with a big goofy grin on my face! I always try to wait until after Thanksgiving but after having my daughter, I just can’t wait to set up all our Christmas stuff. Especially, writing that letter to Santa. So cute! I’m already listening to Christmas music in the car but am waiting to decorate until the day after Thanksgiving. I love the Atlanta aquarium! 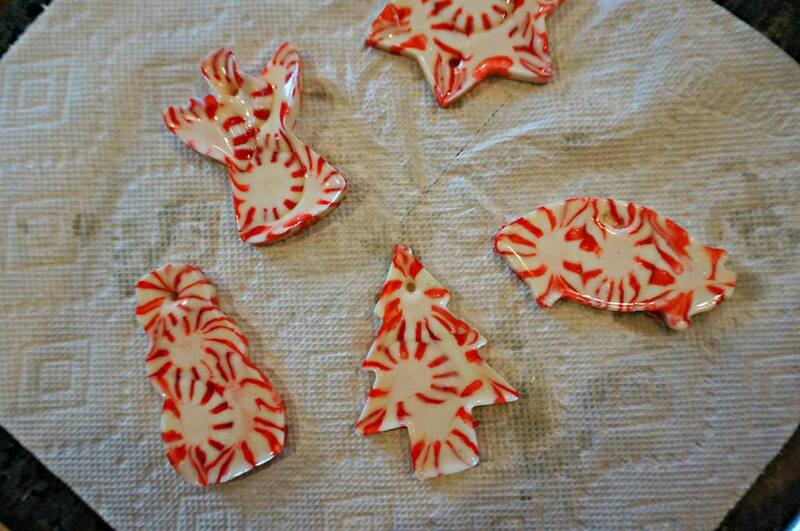 And that is such a great idea for peppermint ornaments! Heather recently posted..Send coffee… and donuts while you’re at it. 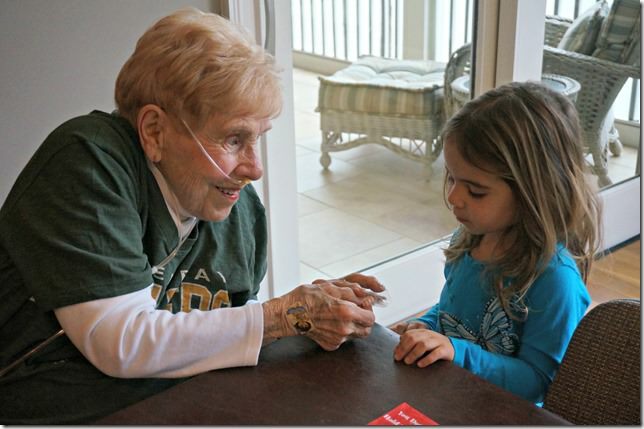 I spy Grandma Betty wearing a Green Bay Packers shirt! Go Pack Go! Love it! I love the ornament idea! I might make some for cubicle decorations! Also, I have a strict rule to not listen to Christmas music until the day after Thanksgiving. Some has been creeping into my radio when I roll through areas with patchy signal service, but I’m holding out til Friday! That is the cutest little craft idea! Totally new to me! I have always wanted to go to that aquarium, it looks so awesome! Love that craft! I decorated for Christmas two weeks ago! Yep! Sure did! Except for the tree, because we get a real one. I’m a Georgia girl as well and we will be spending time with family just north of Atlanta, right outside the perimeter. I love spending time with family and am so excited for the holidays with our little one! Also excited for the in laws to watch her so the hubbs and I can enjoy a lunch date! We live in Ga too (South Ga), love the aquarium! It been a couple of years since we have been need to take the girls back there! I’m glad you posted the peppermint craft, we will definitely have to do that one. Have a wonderful Thanksgiving! Lauren @ Fun, Fit, and Fabulous! 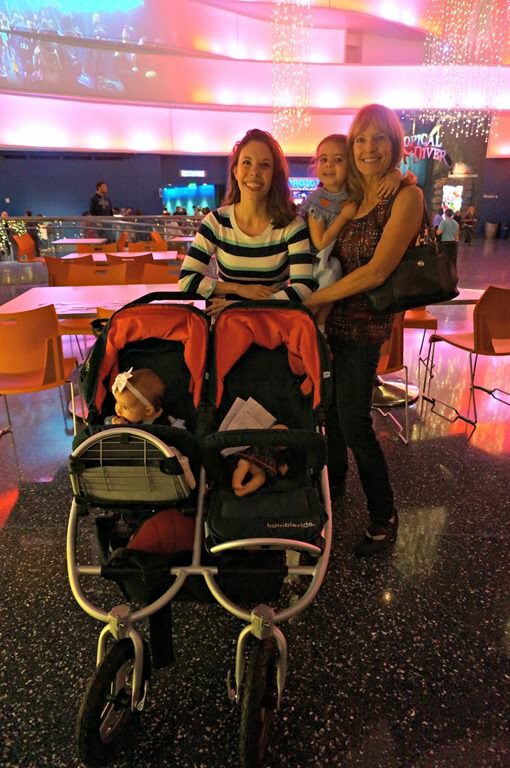 recently posted..A day in the life of Annabelle and I! I live in Dunwoody (when I’m not traveling)! Small world. I noticed a lot of people saying they’re from that area too! I love the peppermint idea! I was actually disappointed in the GA aquarium! I REALLY like the Chattanooga one (I think just cause of their sea otters) so I was a bit let down when the GA one opened! The aquarium is always crazy too. 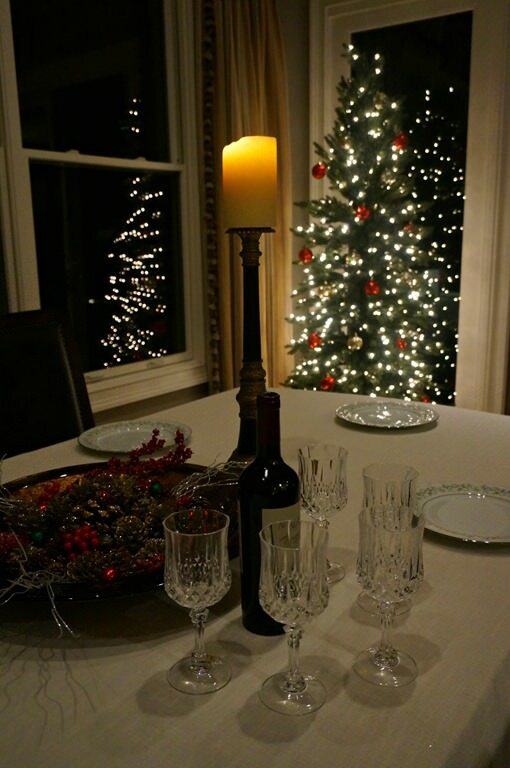 I normally decorate after Thanksgiving but I’ve been going out of the country in December in the last few years, so I tend not to decorate since I won’t be home anyway. And this year I get home from travel nursing on the 21 and then my husband and I are going to FL to spend it with his family, so no decorations again! I’m definitely decorating next year though! Shari recently posted..26 Reasons to be Thankful.